Have you seen it? Oh, you know what we’re referring to. Only the most talked about movie to hit the screen in ages… Star Wars: The Force Awakens!!! For the two of us, seeing SWTFA was an epic adventure. First of all, the location was everything! 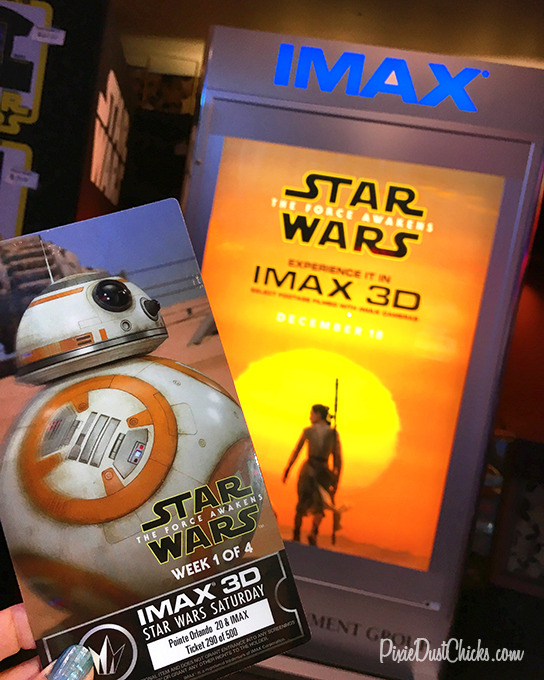 We watched it at Regal Pointe Orlando Stadium 20 and IMAX on International Drive, the only location that has real IMAX as well as a giant screen. Yep, we said giant, as in 5 stories high! Plus, you have amazing sound and stadium seating…it’s like we were the only ones in the theatre! Second, the other point that made our viewing so epic was seeing it together. SWTFA is the first movie in the Star Wars series that our whole family has watched together in a theater. It might seem silly to some, but considering that one of us saw the original trilogy in theaters as a little girl while the other one has watched only via a tv screen at home, sharing our love of Star Wars by watching a new episode on the big screen was awesome for us! Now, as for the actual movie itself, we were floored! From the first moments of the familiar text crawl, we felt completely engulfed in the story. The crawl quickly got us caught up on what has happened over the last 30 years in the Star Wars universe, and then we took off for a wild ride. Along the way, we met new characters Rey, Finn and Poe as well as a new and charming droid, BB-8. Speaking of this spherical new astromech friend, let’s just focus for a moment on the amazingness that is BB-8. He is equal parts cute-overload and cunning sidekick. Seriously, so much to love! As for the new humans, Rey is the ultimate, super-cool, strong female character. We’re excited about her journey in the upcoming movies! Finn came across as a man who strives to do the right thing even at the cost of his own life. We feel that there is way more to his story than meets the eye. And Poe? Poe is the greatest pilot in the galaxy. Enough said! We loved seeing classic, favorite characters from the original trilogy and how their stories have developed over the decades. This installment was a fantastic bridge from the main players we first met in Star Wars in 1977 to the new generation of galactic heroes and villains. It’s difficult to discuss more without giving away too much, and we would never want to spoil this experience for anyone who has yet to see this film. So stay tuned for a deeper discussion next month when we hash out more details and get your perspective on this blockbuster! We’d love to know your thoughts in the comments below, but please remember…no spoilers, sweeties! Guess what! OUR SHOP IS NOW OPEN!! 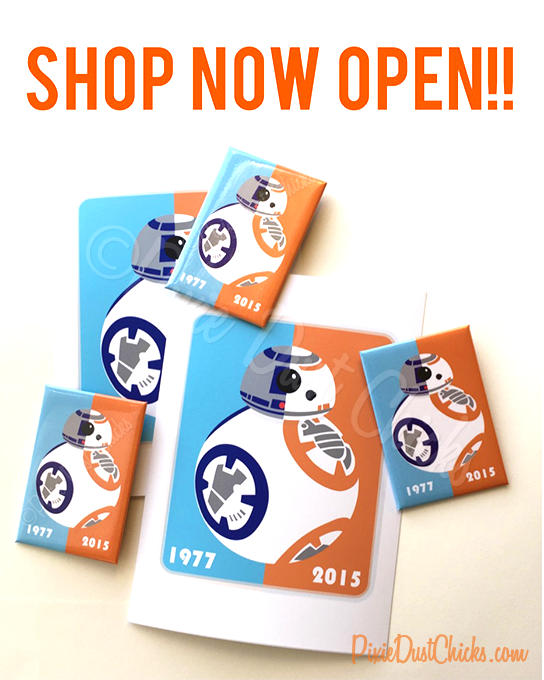 That’s right, you can now get your own prints and buttons of our original art, “Droid Legacy”, at our new Etsy page! Our Etsy page is live and will be open until 8pm Thursday, 12/17. We’re having a small opening now so we can get everyone’s orders shipped to them by Christmas, so if “These are the droids you’re looking for” to fill stockings then you’d better hurry! Are you ready? Do you have your tickets? Do you remember all of your Jedi training? Good. Then you might be ready for the opening of Star Wars: The Force Awakens! Oh, come on. You know you’ve been caught up in the buzz over this movie and it’s long-anticipated arrival in a theater near you. In just two days (two days!!!) people around the globe will be watching (or waiting to watch) the continuation of the movie franchise that began 38 years ago in a galaxy far, far away. And we are beside ourselves with excitement!! One of the things we love about Star Wars: TFA are the old and new characters. There are so many beloved old friends and new favorites! 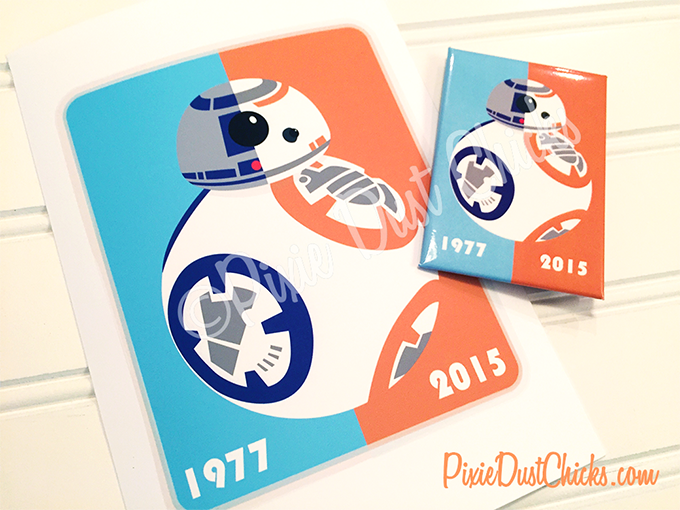 So we created an art print to celebrate the joining of old and new Star Wars fans. We call this piece “Droid Legacy”! There’s a new attraction coming soon to Disney’s Hollywood Studios called Star Wars Launch Bay! We’re not sure what it will entail, but we know that it will bring guests closer to the Star Wars movie franchise and help introduce fans to the upcoming Star Wars: The Force Awakens movie to be released on December 17, 2015. 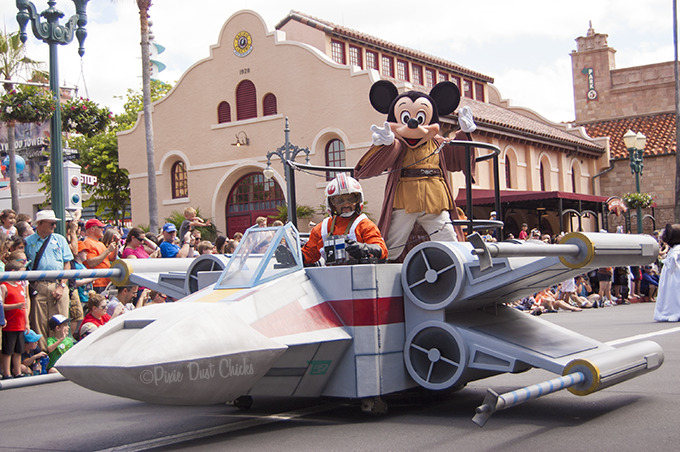 The new SW Launch Bay will be located in the former site of the Magic of Disney Animation. 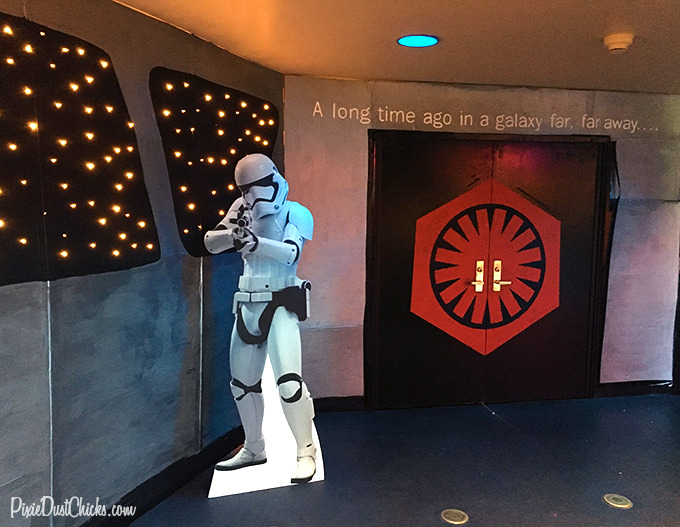 While we are sad to say goodby to this amazing attraction (and especially to their free drawing classes), we both cannot wait to experience this new Star Wars experience!